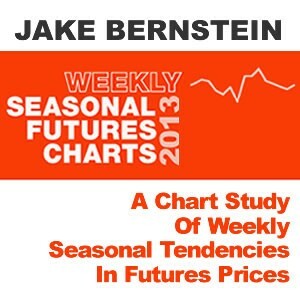 A Chart Study of Weekly Seasonal Tendencies in Futures Prices Since the 1970s my Seasonal Futures Charts have been an industry standard as well as an indispensable tool to futures traders the world over. These charts provide valuable seasonal trend and probability information to short-term traders, speculators, hedgers and position traders. At a glance they can tell you the % of time up or down for the typical week, as well as normalized size of move and average seasonal top or bottom by futures contract month on all active US futures. Here is your opportunity to get the NEW 2013 Edition of this outstanding reference work containing over 197 pages (electronic format) with clear, concise explanatory details on what these amazing charts contain, how they were constructed, what they mean and how to use them to your decisive advantage!